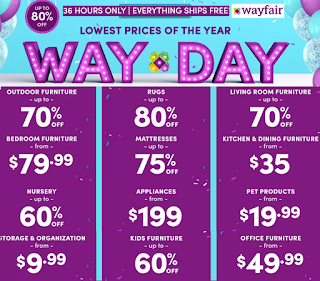 SALE OF THE YEAR AT WAYFAIR!!! Wayfair Home and Furniture Items Lowest Prices of The Year + Free Shipping! Up to 80% Off. Great Time To Buy Furniture for Patio, Living Rom, Bedroom or Nursery, Rugs, Pet Products, Appliances, Storage and Organization Products, Home items and Much More. They basically have anything you will need for your home, furntire and decor. Wayfair is LEGIT - it's a really great place to shop, they ship fast, have really nice items and now with these prices and Free shipping it's a no brainer. You can also get an extra $20 off $50 purchase for even more savings. CHECK OUT THIS SALE! !